I still don’t have a clear direction for Thoughtful Thursday posts, so for today I thought I would detail the various sources that I use on a daily basis to help me dig deeper and ask those questions that help give my life direction. Dumping Ground: I have used the website, 750 words, going on nearly three years now. 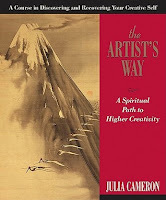 The inspiration for the website came from Julia Cameron’s best-seller, The Artist’s Way, where she advocates writing three full pages first thing each morning: stream of consciousness writing that allows you to empty the mind of worries, stress, confusions, etc….in order to make room for creative pursuits. While she advocates long-hand, typing on a computer in this secure format is more conducive to my lifestyle. I’m not sure that I have made much room for creativity to take hold (yet) – but I have found that this daily activity helps me to prioritize tasks and put life in proper perspective. Writing Focus: I currently use two daily tools to help me think about the writing life – although I have not yet translated those thoughts to an actual writing lifestyle (I have faith that will come later). The first is the book, A Year of Writing Dangerously, where the author has daily messages to motivate would-be authors to face their fears and just write. Each message is then accompanied by a quote from a published author. Yesterday’s prompt was entitled: Getting Permission – and the author states: If you feel you need permission to write about yourself, or whatever you feel you need to write about, I give you permission. If you write for yourself, you will reach all the people you want to write for. The other tool I use is Patti Digh’s Daily Rock. 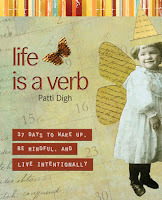 As some of you may recall, Patti Digh is the author of Life is a Verb, which inspired me to develop a series of writing prompts two summers ago. She helps me to focus on the moment – to stop putting off til tomorrow because who knows how much time they have left (her father died only 37 days after learning he had cancer). Photography Focus: Writing comes naturally for me – not that I do it well, but it comes easily. Photography does not. I have NO natural ability. I must constantly think about the rules of composition; I must stop and analyze the light before I attempt to set the ISO – Aperture – Shutter Speed controls. I have yet to learn how the camera sees the world and become quite frustrated when my picture is not what I saw with the naked eye. And yet… I still love the possibilities that photography offers to help me relate to the world in which I live. And I am determined to learn the craft. After all….don’t I teach students that writing can be learned – they just have to be willing to put in the effort? I want to follow my own advice. Of course improvement comes from practice – and daily practice is best. However, I struggle finding variety in the world around me. That is where Capture Your 365 photo prompts help. Katrina does not necessarily suggest WHAT to photograph, but rather WHAT EMOTION to capture. And this, to me, is the essence of photography. Today’s prompt is Real Life – which she also offers Everyday – Ordinary – Daily as possible synonyms. It is a rainy day in Kansas, so I think I will be forced to find a suitable subject indoors. I was thinking perhaps a photo of emptying the dishwasher …. but I’m not sure. What would you photograph to capture “real life” ? Real Life photos scare me. If I were to take a picture of my writing room as it is today, holy moly. Most of the rest of my house is neat and tidy, but the room where I spend most of my time looks … well, cluttered to put it mildly. Real life outdoors today would mean gray skies and melting snow–not exactly a photogenic scene, either. Real life means I'd take a picture of me at the dentist's office getting a Cone Scan . . . not picture worthy. I think Real Life photos are often embellished! (At least, the ones I look at on all the Artful Blogs, such as Posy Gets Cosy. Several of the links you listed have my curiosity!! I did Rick's Devotional one year and am interested in this one for sure. I also like the Life is a Verb idea. I'm not sure that I would be able to write three pages of free flow every day but I do sometimes post on my private blog and just let the words flow!!!! I liked this Thoughtful Thursday posts so please don't stress about it too much because I believe that whatever you post will be a benefit to someone somewhere!!! We finally got a DSLR camera last month, and I'm itching to give it a try, so thank you for the link to the photo prompts! I think your Thoughtful Thursday posts will be wonderful – I liked all the things you talked about in this one. I have a question about 750 words…how do you know that your words are kept private? I visited the site, and loved the idea, because I can type the morning pages a lot faster than I can write them…but I wondered where the blog posts went? I agree with writing in the morning. It's so much more productive to write before your mind gets cluttered. Good post.